1. Roll a little ball of clay, about 1" to 2" in diameter. 2. Press your thumb into the center of the ball, creating a deep pit, and smush the clay around your thumb so that it becomes more of an oval oblong shape. 3. Using your palm as a surface of resistance, start pressing your thumb down (towards the bottom of the pot) and outward (against your other palm), rotating the pot each time to ensure it turns out even. Keep going until you've reached the size pot you want! Mine are usually about 1/8" to 1/4" in thickness. As you go along, try to apply more pressure at the tip of your thumb (at the bottom of the pot) to keep the opening of the pot from becoming too wide. If your clay is a little too soft and doesn't hold form well while you're shaping it, throw the ball of clay in the refrigerator for 10 minutes to give it more resilience. Sometimes, I end up redoing my pot several times because it got too wide or too thin or whatever, but that just adds to the therapeutic benefits! Plus, it doesn't take that long and you definitely get better with practice! 4. Do some extra decorating and finishing - see below for inspiration! 6. 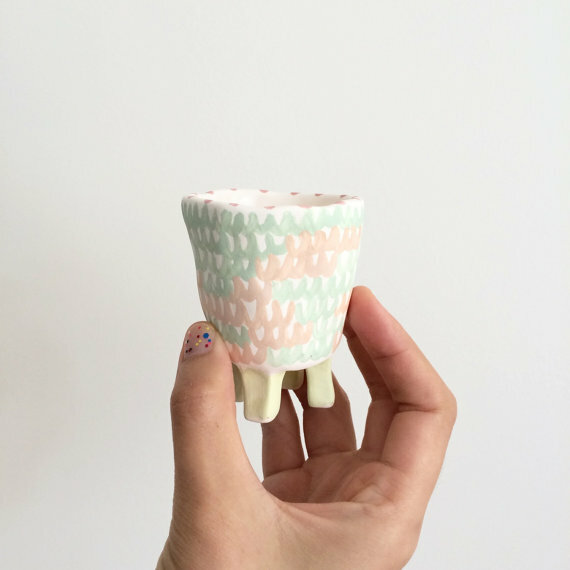 You can finish your pots by painting them with nail polish, acrylic paint, and/or Sculpey glaze for some extra sheen! Aren't they adorable? I've been making TONS of them and am going to use them as little thank you, housewarming, and "just because" gifts!